Kavita Saharia, a passionate blogger who writes about North Eastern India, shared this beautiful article on Kashmira Kakati and her amazing work in the field of wildlife conservation. This post is from her personal blog. So friends here I am, introducing you to Kashmira Kakati, a wildlife biologist who recently announced the discovery of seven species of wild cats in the little known JEYPORE-DEHING forests in Assam…the highest concentration of photo documented wild cats species anywhere in the world. After completing her graduation in zoology from Assam she earned her master’s degree at the Wildlife Institute of India Dehradun. 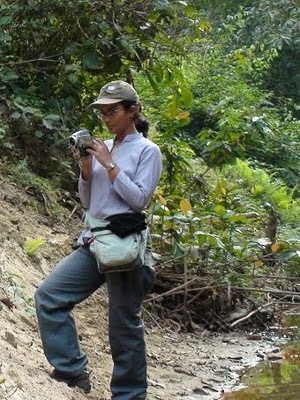 Later she did her PhD at Cambridge University studying the impact of forest fragmentation on Hoolock Gibbons in Assam. From a period of the years 2002-2007 she took time off to raise her two adorable sons with her Elephant biologist husband Christie Williams. During her Gibbon study she worked in the Jeypore-Dehing forests as it is one of the last remaining strongholds of the Gibbons (one of the 25 most endangered primates in the world). Let me tell you little bit about Jeypore-Dehing forest of Assam. The forest here are of unique type called the Assam Valley wet evergreen forest and is amongst the last stretches remaining. This forest was not particularly known for their wild life. During last 100 years the area had been logged very heavily and also it is a lucrative crude oil catchment where production has been going on continuously. Until recently there also used to be coalmines. Deforestation, poaching, mega hydro electrical projects, extraction of crude oil and coal is a major threat to these forests. Kashmira thinks that these forests need a well regulated tourism and a heavy plantation and forest restoration plan. The evergreen forest is very important both in terms of being a watershed as well as in holding back floods — a scourge that afflicts most of Assam for months during the rainy season. Most experts agree that floods have become an intractable problem because we have been steadily destroying our original hill and valley forests — nearly three-quarters of the Assam Valley forests have disappeared within the last several decades. Forests also act as local climate regulators, a key factor for the agriculture in this region. She used to see a lots of signs of the presence of other animals especially carnivores while she was following gibbons for her research. 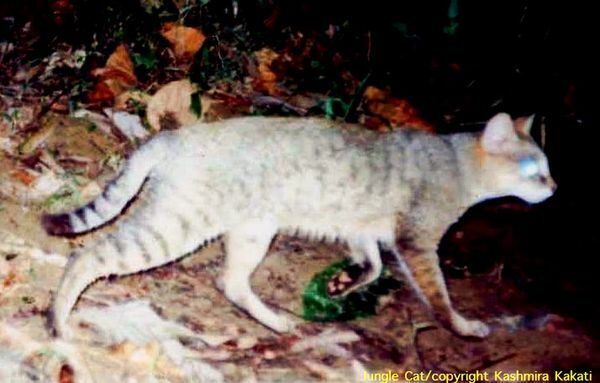 Even if she spent real long hours in the forest she never actually encountered any carnivores as they are nocturnal. To start and support her camera trap survey of the forest she received a small grant from CEPF(critical ecosystem partnership fund – it is a global initiative that provides assistance in safeguarding the Earth’s biodiversity hotspots) and also a matching grant from the Rufford Small Grant Foundation, U.K. around the same time – it helped her run the project for two whole years. Her research was also supported by the Forest Dept of Assam Government and the Wildlife Conservation Society of India. 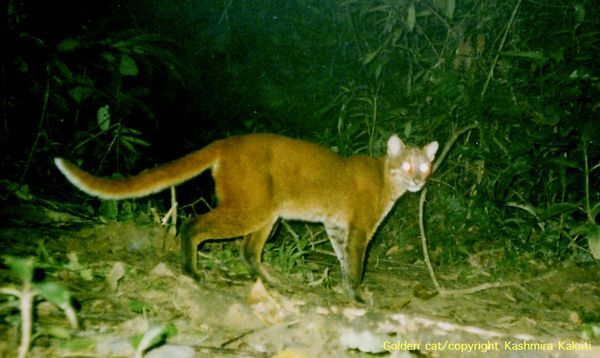 As the pictures started coming in, she herself was completely surprised as she had not expected to find so many mammal species still surviving – 45 at last count, 19 carnivores, 7 of wild cats. 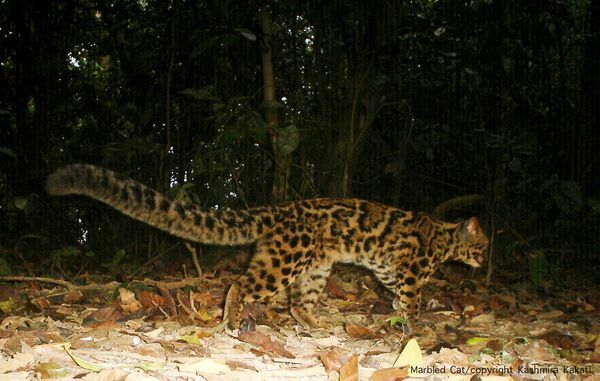 The seven species caught on the camera are the rare and elusive -Clouded leopard (Neofelis Nebulosa), Marbled Cat (Pardofelis Marmoratee), Golden Cat (Captopuma Lemminckil) and four relatively widely distributed species of tiger (Panthera Tigris), Leopard (Panthera Pardees), Leopard Cat (Prionailurus Bengaleniss) and Jungle Cat (Felis Chaus). Jeypore-Dehing Forests now takes its place amongst India’s Top Wildlife areas after proven to be holding one of the India’s richest carnivore communities. The pictures of the seven species of cats in fact place it top in the world in terms of field diversity recorded in forest. Kashmira strongly feels that highlighting the carnivores is only one way of getting attention to these forests as the ecological security of the area depends on it. Her efforts are surely going to succeed. Kavita Saharia is a dental surgeon in Guwahati, Assam. She blogs at kavitasaharia-myroom.com. This article is from her blog. Previous …And this is why you should go organic!